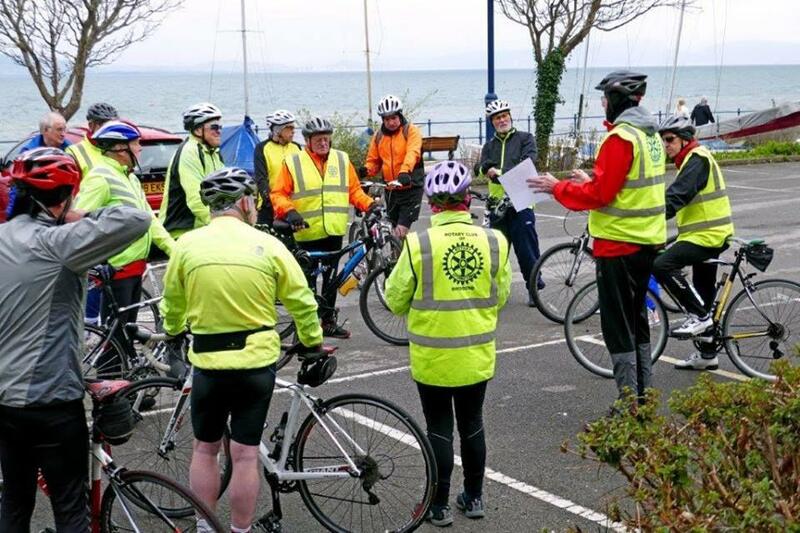 The detailed planning behind the ride was impressive and the support available to the riders from their travelling fans; plenty of water, bananas and chocolate. Five members of Mumbles Club had the easy job of wishing them well and waving them on their way so we gave them some funds, gathered at our last meeting, to help with this excellent cause. Great to meet up with fellow Rotarians who were on a mission to help others; Service above Self comes to mind from these “People of Action”. 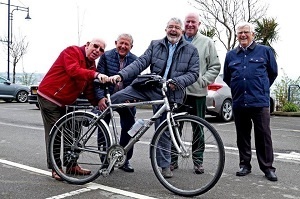 Pictured are the band of cyclists led by President Hopkin plus our President Phil Rogers (an old Bridgend boy himself) being ' assisted' by Rotarian Colin Griffiths (who took the other photos -thanks Colin) Rotarian Lyndon ,Vice-President Gareth and Rotarian Brian to get on his bike (well he is buying the coffee !